WW1 Reenactments Equipment : Great War Tommy WW1 Food Rations Labels : Labels for O.K. Sauce Bottle. WW1 Reproductions and WW1 Reenactors Equipment / Kit - Labels for O.K. Sauce Bottle. Labels for "O.K." Sauce Bottle. 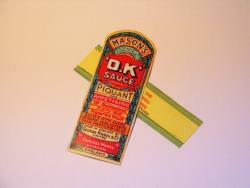 Body & neck labels for Mason's OK sauce, Mason had left the Company by WW1 and production moved from the Chelsea Works after WW1. The origin of the name of this popular sauce is disputed but "H.P", "T.T." and "J.P." were all pre-war favourites.